The capital of Slovenia might be small in terms of size but it’s quality over quantity that makes Ljubljana special. It has everything you need, it is easily accessible, intimate and it quickly makes you believe you know its every nook and cranny. That is precisely why it is a perfect destination for family travel. 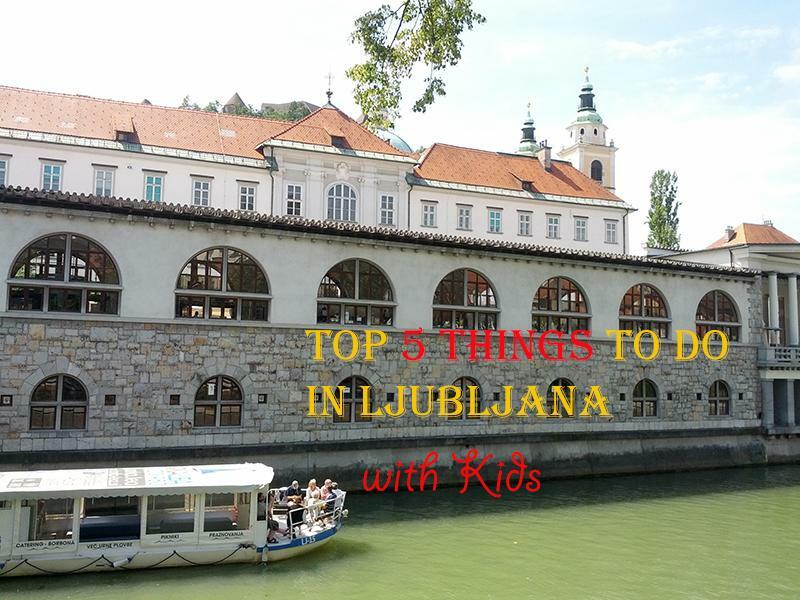 As a local I had a hard time picking just five things, because there truly are more, but after careful consideration of what my kids love the most and what we would do in a heartbeat, this is what I came up with, as the five must-do things in Ljubljana with kids. Of course you will walk up and down the city center, which is beautiful, but to see it in a whole new way, you must take a boat ride. As a local I was skeptical, hey, it seemed like a tourist trap, but once I’ve tried it, I can honestly say it shouldn’t only be the tourists who get to enjoy amazing views, everyone should give it a try. Besides, it also gives you 45 minutes or more (depends on which tour you chose) of respite, while you are still exploring. And your kids are bound to love it, especially because they can observe the ducks, try to catch a glimpse of the fish, just don’t let them watch too closely, go under the many bridges and wave to all the people on other boats or standing on the shore. Ljubljana has a lot of bridges. It might seem that every few meters there’s another one. So, perhaps you can start buy counting those or you can just focus on the most famous ones. Your kids will definitely be impressed with the Triple Bridge which connects the main square with the Old Town and they will probably want to cross all three before moving on. Or maybe they will want to play with all the locks on the Butcher’s Bridge, like mine do after we finish with shopping at the main market on a Saturday morning. But the Dragon Bridge, just a bit further down will definitely grab their attention. You will soon figure out why it has this name and you can keep your kids busy by making them count the big and the small dragons. When they get to 20, you can move on. Now, kids love castles. Of any kind. And the fact that Ljubljana has one is pretty self-evident, since you can spot it from a far, perched on a hill overlooking the whole city, just as any castle should be. No kings or queens ever lived there, its story is not so romantic, as it was a fortress and served as a jail. It will still be enough to get the imagination of the young ones flowing, especially because they can visit the jail. Besides even if you are not into history all that much, the reasons for visiting should also include the best views of the city, the fact that most of it is free, one of the city’s famous restaurants is here, so you can have lunch or just a cup of coffee in the castle square, art exhibitions take place all the time and if you come on a Saturday you can crash a wedding. And you can get to it on foot, by car or enjoy the views by taking the funicular railway, another treat for the young ones. Here is more about the castle. Every city has a green oasis. And for Ljubljana, the largest park Tivoli is much more than that. It’s a place where we go for a run, where we take our kids to play at the playground while we sip coffee by the pond, or we just go and walk around and most often on Sundays take one of the paths leading up to the cute Roznik hill… So, forget your busy schedule and give kids a chance to play with local children, while you sit on the bench and just observe. You can finish it off with a walk over to the zoo, where you get to meet a lot of native animals. Petting zoo is also a special treat for all the kids. This year Ljubljana is celebrating its 2000 birthday, actually then it was under the Romans and it was called Emona. The main event will try to recreate that atmosphere and transform Kongresni square into a part of the Roman territory, with Roman legionaries, workshops, markets, etc. Don’t miss the event taking place between 22nd and 24th of August. But if you do, don’t worry. There are still a lot of remains that have survived to the present day. You can see them at the the City Museum of Ljubljana and then visit the two archaeological parks. But your kids will enjoy it more if you take a tour where you get to put on Roman attire, take a Roman legionnaire as a guide and get to know the daily life and customs of the people, who lived on the site of Ljubljana. What did I forget that you are absolutely sure should be on the list? You surely missed Family centre Mala ulica (Malaulica). Hi, thank you for the tip. We actually did a whole post on Mala ulica; http://coolkidzcooltrips.com/a-visit-to-the-family-center-mala-ulica/. I got some other great suggestions and will soon do a follow up post with new ideas. Ljubljana has also adapted guided tours only for families with pre-school and school children. They are enyoing discovering Ljubljana together. A lot of Slovenian families use this way of exploring their capital, because they realized that actualy do not know a town very well.